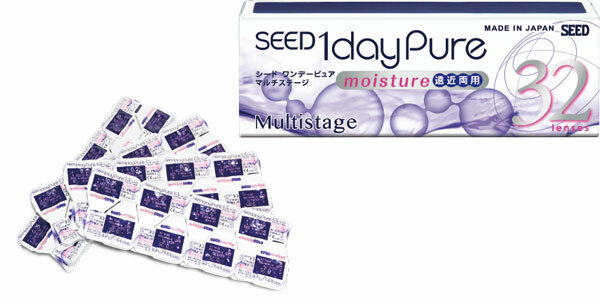 Discover the daily disposable contact lens for presbyopia that daily disposable contact lens users have long desired – SEED 1dayPure Multistage, a contact lens that is Made in Japan. It also offers the unique benefits of worry-free and comfortable use that daily disposable lenses are favored for. To provide users a smooth shift from single vision lens, we have carefully thought of changing the addition power and the optical design for Type A and B, hence minimizing discomfort and maximizing visual performance. This optical design is crafted to deliver “Natural Vision”. SEED also adopted the ‘Adjustable Parametric Design’ by controlling the thickness and curvature for each power, and thinning the bevel design, users can experience greater comfort while wearing it. Using SEED’s original zwitterionic material SIB (SEED Ionic Bond), and Alginic Acid as a natural moisturizing agent, SEED 1dayPure Multistage lenses retain more water to keep your eyes moist and comfortable for extended hours. It also combines a low modulus of a hydrogel lens and high oxygen transmissibility of DK/T of 42.9, this value is high enough to transmit adequate oxygen which is sufficient to support the ocular health of the eyes so that one can enjoy clear and comfortable vision all day long.